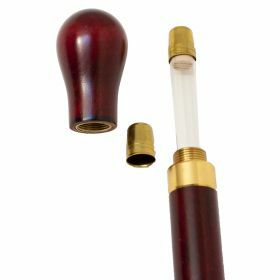 This stick is hand made using the highest quality turned maple, Features a built in flask for those long walks or fill with your preferred alcoholic beverage for those long evenings! The handle on this classic knob stick unscrews to reveal a glass flask (Holds approx 140ml) . Approx. 36.8".